Fogust (for our lovely August). If you’ve lived in San Francisco for any length of time, you’ve heard these phrases. Although this last one is attributed to Mark Twain, there’s some debate about who actually said it. Regardless of who originally uttered this phrase, it sticks in our minds as San Francisco residents because summers are freaking cold and foggy here! The same fog that weighs heavily over the city may also weigh down heavily on you, too, negatively affecting your mood. If you’re already prone to depression, the lack of sun may make it worse. What Mark Twain didn’t know was that to survive summer in San Francisco, you have to befriend it. Yes, if you can learn to love the fog and see the beauty in it while still nurturing your need for sunlight, you’ll lessen your summer suffering. For starters, it’s cold and you want it to be sunny and warm. Summer in San Francisco can feel a lot like winter. You may find yourself doing common nesting winter behaviors during the summer months. For instance, you may want to stay inside all day or you may struggle to muster up the energy to do anything outside of your daily routine. As you might have guessed, the fog is usually to blame for those dreary feelings. Then there’s the wind, which can make doing anything outside downright unpleasant. Also, fog and depression are tied closely together. Lack of sunlight can actually increase depression. For example, you wake up on a weekend morning and the city is encased in fog. You can’t see the houses or apartments across the street because the fog is so thick. Those weekend plans seem far less appealing now. You may feel like going back to bed. It’s not uncommon to experience a sinking feeling when you go for a period without seeing the sun. And this feeling has a name: Seasonal Affective Disorder. Typically known as the winter blues, Seasonal Affective Disorder (SAD) is depression that comes and goes with the seasons. If you are prone to depression, it can get worse during the foggy San Francisco summer instead of better. This is especially true if you’re a transplant to San Francisco. Naturally, you will associate summertime with warm rays of sunshine and plenty of opportunity for outdoor activities. When you’re used to the summer sun, battling the cold, fog and wind might shock you. After all, you don’t expect to bundle up in scarves and hats in the middle of August. Nor do you plan to get soaked from the fog on your way to work. 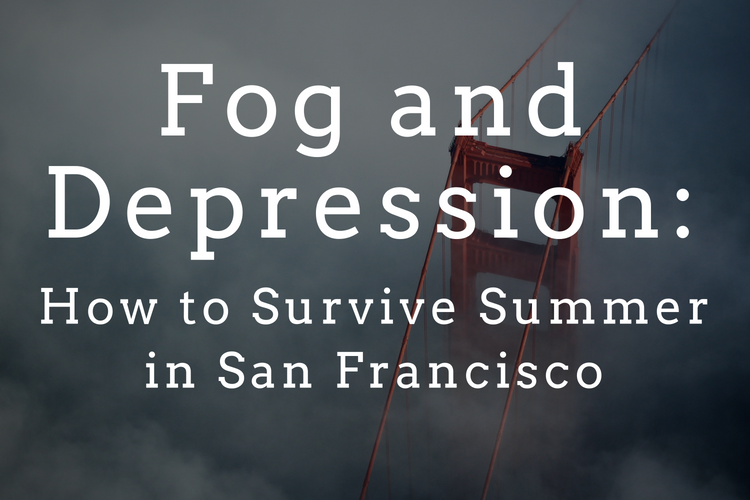 But during summer in San Francisco, fog and depression are both common. Day after day, this can drain you and increase feelings of hopelessness, lethargy, and sadness. Although you’d probably love to snap your fingers and vanquish the fog, that’s not exactly a plausible solution. While you can’t magically change the weather, you can change how you respond to it. You can learn to love the fog and do things that get you out of the city to soak up the sun. Keep in mind that the fog is usually just concentrated in the city. Because of upwelling and a shift in Pacific currents, the coast is cold during the summer. Fog forms when moisture condenses in this cool coastal air. If you’re new to San Francisco, you’ll quickly discover that if you drive even just thirty minutes out of the city you’ll find some glorious sun. We need the sun, so safeguard your mental health by honoring that need and finding sun by exploring the Bay Area. Radical Acceptance is a profound DBT skill that can change your relationship with the fog. Radical Acceptance is saying yes to reality instead of no, no, no. The first step in Radical Acceptance is to notice you are fighting reality. One sign that you’re fighting reality is irritability and grumpiness about the weather. You may start fantasizing about other cities that have typical summers. Or, you get angry and want to give up on having a good day altogether. Radical Acceptance doesn’t mean you have to like the weather, but you stop wishing it were different. When you stop fighting reality, you decrease your suffering and allow your brain to think creatively about how to respond wisely to the present moment, rather than reacting automatically. If you Radically Accept the fog, possibilities open up. You might also begin to appreciate the eerie, soft beauty of the fog. And remember, summer is coming: we will get our sun and summer vibes in the warm months of September and October. Need help surviving summer in San Francisco? Call (415) 310-5142 to get started with therapy at our San Francisco practice. We offer individual therapy, couples therapy, and DBT.